The photograph above shows one of the light artillery support vehicles of the Imperial Arctic Expeditionary Force. In 1877 these troops were sent to the island of Svalbard to support the Kingdom of Norway in their increasingly-fractious territorial disagreements with the Russian Empire. Russian submersibles had, five years previously, planted the double-headed eagle flag on the seabed beneath the Arctic ice, ostensibly claiming the entire Arctic Ocean as their sovereign territory. Naturally, the Norwegians objected strongly to this claim, and the area around the islands of Svalbard and Novaya Zemelya became the scene for a high-stakes game of political gamesmanship and military maneuvre. Imperial commanders were reluctant to become involved, convinced they could do little to assist; the Imperial Navy was ill-suited to the ice-clogged waters and the Royal Aeronautic Corps could not fly dirigibles in the frigid and stormy skies. However, following a direct appeal to the Queen, Imperial military chiefs were instructed to do all they could to support the Norwegians. The following summer, the Arctic Expeditionary Force left harbour and sailed for Svalbard. Despite the Force never seeing any action, this open show of support from the Empire was to give the Romanov dynasty pause for thought. The brief hiatus in Russian operations allowed the Norwegians to properly arrange their defence forces, albeit for a conflict that never materialised. Russian plans for territorial expansion were to be forgotten in the chaos of Revolution only a few years later. 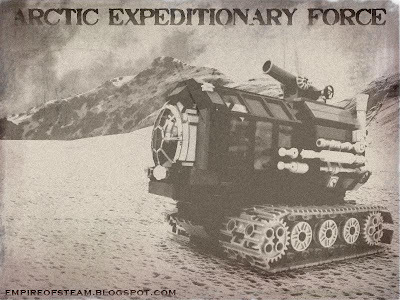 In truth, the Arctic Expeditionary Force was woefully ill-equipped. Most commentators agree that if conflict with Russian forces had ensued on Svalbard, Imperial troops would have been quickly overwhelmed. This was an Imperial bluff that could have proved an embarassing defeat. Further photographic images of this vehicle may be viewed here.